The latest version of Apple’s mobile OS brings a variety of upgrades to Siri, 3D Touch, the Lock Screen, Maps and other features. Ten versions of iOS have been released since the iPhone's debut in 2007. At the time, the groundbreaking OS, coupled with innovative touchscreen hardware, changed the mobile landscape and altered what people expect from their mobile devices. Now, a decade later, comes a feature-rich iOS 10, delivering subtle refinements to the user interface, new capabilities and important enhancements to oft-used applications. The overall effect is a cohesive OS made more useful by tying together functions in ways that allow you to do more without having to jump between apps. After previewing iOS 10 in June and offering it as a public beta, Apple rolled out the finished version today. This is the fourth 64-bit version of iOS, which runs on hardware starting with the iPhone 5, the fourth-generation iPad and the post-2015 iPod touch. For this review, I tested iOS 10 on my iPhone 6S Plus, a 12.9-in. iPad Pro and an iPad mini; my main focus is on the iPhone experience. Obligatory warning: Anyone preparing to install the update should go to Settings > iCloud > Storage & Backup and tap Backup Now. This will back up your device in case anything goes awry during the installation. Alternatively, plug your mobile device into a Mac running iTunes (one with enough storage to back up your files). I didn't run into any problems, but the old adage still holds: Better safe than sorry. iOS 10 can be found in the General > Software Update section of the Settings app. For the update to begin, you need to have a Wi-Fi connection and at least 50% battery life. There is also an option to delay the installation until the middle of the night, when your use won't be affected. If you need a fresh version of iOS 10 for some reason -- say, if you jailbreak -- plugging your device into an iTunes-enabled computer will allow for Upgrades and Restores. Upgrades leave data in place; a Restore erases device data, including yours. Once the update completes, Apple's Setup Assistant will guide you through the process of connecting to a Wi-Fi network and enabling Location Services. If the device was upgraded using the Restore option, the Setup Assistant will let you choose whether to install your data from a backup or set the device up as though it were new. The look and feel of the new OS should be familiar. The interface is still full of bright, colorful layers, with parts of the foreground graphics influenced by the colors beneath. The parallax effect on the wallpaper is subtler than before, and though navigating the interface still involves zooming in and out of content, the animation for opening a folder has been changed. Instead of zooming through the entire Home Screen grid into the folder like before, the folder is front and center, and pops open and outward to display its contents,. Many Apple apps can now be removed from the Home Screen. If you don't use things like Apple Maps, Calendar, Mail or Notes, they can be deleted just like any third-party app. When removed, some of them are hidden, others are deleted outright, but can be re-downloaded from the App Store later if needed. Some apps, though, cannot be removed, including Photos, Safari, Messages, Settings, App Store, Clock and News. There is one change that is not immediately obvious: iOS offers better and more widespread support for 3D Touch. The feature debuted in iOS 9 last year, but it's clear Apple has had a year to think of better uses for it. On the Home Screen, firmly pressing an app or folder reveals a quick action pop-up menu; if it's a folder, the menu shows which apps inside have alerts and allows easy renaming of the folder itself. Other 3D Touch results are contextually dynamic. For instance, Photos displays Search, One Year Ago, Favorites, Most Recent and a single-line grid of dynamically generated photo collections. Maps, on the other hand, displays options to Search Nearby, Send Location, Mark Location and show upcoming destinations. The Settings app gives quick shortcuts to Battery, Cellular, Wi-Fi, and Bluetooth; while the Camera app lets you jump to specific shooting modes. In Notification Center, the X to clear a group of alerts changes to a Clear All when pressed firmly; and Flashlight offers three brightness level options. There are numerous examples of the Force Touch technology implemented throughout the system, so it doesn't hurt to experiment by pressing firmly in different locations. (Third-party apps will also have quick actions via 3D Touch, but developers have to code for it.) Keep pressing; you could discover a useful shortcut. Left: Firmly pressing an app's icon reveals a quick action pop-up menu. Right: iOS 10 features a revamped Widget section. There are more obvious changes as well. For example, swiping left-to-right on the Home Screen calls up the revamped Widget section. At the top of this section is a Universal Search text input field that searches the entire device, including the content of Apple apps and supported third-party apps. It's pinned to the top of the display, even when scrolling, allowing easy access to anything you want to find. Below the Search field is the date, in a large, crisp font. Below that are new, frosted-framed widgets. How many are there and what they display is entirely up to you; this new widget screen is customizable to reflect your priorities. Want to see the weather forecast? Flight information? Breaking News? Upcoming meetings? Whether you're close to filling your daily fitness Activity Rings? There's a widget for you. If action is required, tapping the widget launches the corresponding app. There are already thousands of apps with widget support, and there will be thousands more once developers update their apps. The Widget Screen is accessible with a swipe from three places in the operating system: the Home Screen, the Notification area and the Lock Screen. At first glance, a locked iPhone looks like it always did. Phone status indicators such as cellular- and Wi-Fi-connection strength or battery life still live near the top of the display, though there is a new additional Lock icon in the center of the status bar -- we'll get to that in a second. Large text depicting date and time is still front and center, and Handoff-enabled app icons still show up on the lower left as needed. Like before, swiping down from the top of the screen brings forth Notifications, and swiping up from the bottom brings up the Control Center menu. There is one noticeable omission: The "Slide to Unlock" text -- an iPhone staple since the beginning -- is gone. (Though after a few seconds, the command "Press home to unlock" appears in small text above the Home button.) As more iPhone users started to log into their phone using Touch ID, the Slide to Unlock option became less necessary, and (as previously mentioned) in iOS 10 sliding to the right on the Lock Screen now brings up the Widgets screen. Also new: Swiping from right to left on the Lock Screen activates the camera, making it easier to launch into picture or video mode with one hand. As before, any received Notification will appear centered on the Lock Screen. Now it's time to revisit that Lock icon at the top center of the display. It's there because the iPhone can be unlocked without opening to the Home screen. Simply touching the Touch ID fingerprint sensor on the Home button will unlock the phone and leave you on the Lock screen; pressing down on the Home button will unlock the phone and open up the Home screen. Why would you want to unlock the phone and stay on the Lock screen? 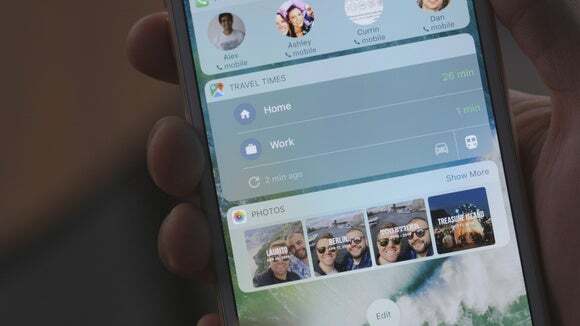 In iOS 10, actions such as taking a picture or video and sharing it with friends and social media can be done without leaving the Lock screen. And because Notifications are even smarter this round, you may not need to unlock the phone. Since some of the Notifications from the Lock screen require access to important data, you may be asked to authenticate yourself; a finger touch on the Home button will confirm your identity. It's also important to note that when accessing the Widgets screen while the phone is locked, you'll see some that don't display data or allow actions without authentication; again, touching a finger to the Home button displays any confidential data and allows actions to be performed. With all of these improvements, it is now possible to be productive in more apps without ever having to unlock your phone. Left: A new Lock icon in the upper status bar means the iPhone can be unlocked without opening to the Home screen. Right: Siri's voice can now be customized for gender and accent. Siri, Apple's voice-enabled assistant, has also been improved, and now offers far more functionality and scope -- especially for third-party apps. If Siri doesn't hear a request correctly, you can select corrected commands via a list of transcribed options, which display variations of what you said. You can still go back and correct Siri manually, but the transcription variations make it easier to do so faster. Even better, Siri learns from the corrections, so your device becomes more accurate over time. Another thing: Siri understands more commands, both within iOS and in certain third-party apps. It can search photos by content, location and people; start video and voice calls; begin, pause and end workouts; send and receive payments; send messages; and book rides from services like Lyft and Uber. This is the first time it has been open to outside developers, and though it comes with initial limitations, this is the first step to enabling more voice-controlled productivity. Finally, Siri's Settings pane allows for some customization. You can choose whether the voice is male or female, as well as the accent (there are choices for American, Australian or British). Under the Voice Feedback section, there is a setting which shuts Siri up when the mute button is toggled on. Messages is the most popular iPhone app, according to Apple, and it has hundreds of millions of regular users. But Messages isn't the only player in town -- there's competition from What's App, SnapChat, Skype, Facebook and other third parties. So, not surprisingly, in iOS 10 Messages has upped its game. When it comes to standard text messaging, it's easy to misinterpret messages in a medium in which tone is usually implied, so the ability to share photos, videos, and emojis helps convey emotions and nuance. There are a variety of new features in iOS 10 that help reduce miscommunication. Messages now supports Mark Up, allowing for the modification of photos as well as videos; and it offers Rich Links with in-line previews of websites, videos and other content. Plus, emojis now display at three times their size, making them easier to see without resorting to squinting. Apple has also made it easier to use emojis in place of text. Swapping to the emoji keyboard scans the message in progress, and highlights words that can be substituted with emoji counterparts. And with a press and hold, the Tap Back feature will allow for reactions to specific messages -- like a heart, thumbs up/down, laugh, bewilderment or surprise. For even more emotion, messages can be sent with Bubble and Screen effects. Bubble effects apply animation and behavior to text, and include such behaviors as Slam, Loud, Gentle and Invisible Ink. Screen effects apply balloons, confetti, lasers, fireworks or shooting stars to the background of messages. To activate Bubble and Screen effects, you press firmly on the Send arrow in Messages; then you'll be able to choose animated text effects. Near the top of the display is a toggle for Screen effects; swipe to see the other effects, and tap the blue Up arrow to send the message with the effect you choose.